For the first time in a long time on this blog, I found myself writing paragraphs and deleting them, venturing forward with sentences and then frustratedly reeling them back in with the backspace button. I’m not sure what’s more annoying – this whole process, or the fact that what I’m trying to write isn’t even a revelatory thing or big news, it’s just trying to knead it into the right shape that’s annoying me. But because I don’t have time, I’ll just try, and hopefully people pick up on what I’m putting down. I’m pretty sure some version of this question was voiced in an Anastasia Krupnik book, but is there a point in your adult life where you suddenly become a proper grown up? Where things fall into place? I’m not claiming I’m the only person in the world to be constantly forgetful, concerningly clumsy, bafflingly untidy, bad with important papers/remembering dates/doing tasks by a certain date, constantly turning up to appointments at least a week early and heart-thumpingly anxious (Not to undersell myself, book-deal people. You’re different. I can deliver you a sparkling diamond of a manuscript by like, six weeks ago.) I also am not seeking perfection or anything, I suspect the answer to all of this is “you learn from your mistakes and you make lists and just be tidy already”, and the fact that it doesn’t seem fair that some people are just more developed and self-assured in these areas naturally confirms in my head that I’m just not grown-up yet. It doesn’t help that people always think I look years younger than I am – I’m not quiiiite old enough for it to be a compliment – am I ever going to get it right? Yes, duplex. 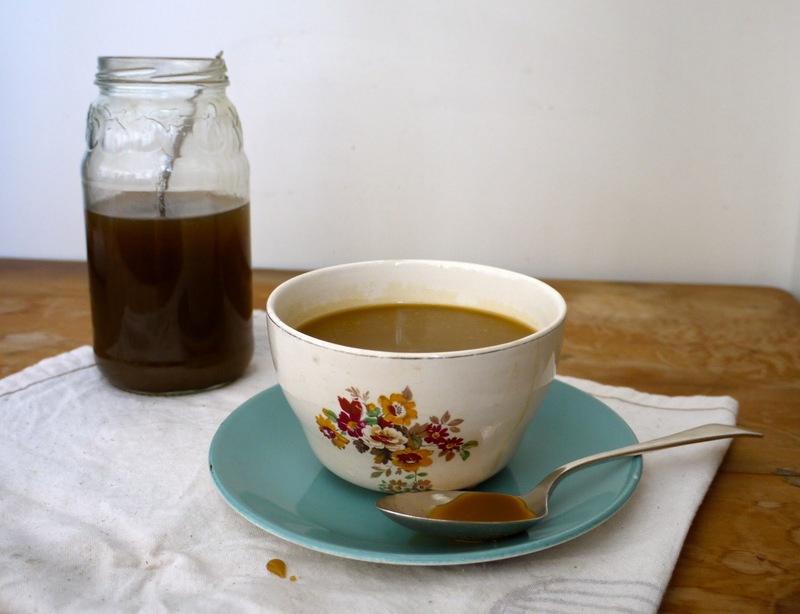 One recipe for plain Salted Caramel Sauce and one recipe for Vegan Salted Caramel Sauce. The former is about as perfect as it can get, the latter was an experiment I’m not sure I’ve properly perfected, but it’s still great enough that I’ll share it with you confidently. Salted caramel seems to be quite the bandwagon these days but it’s so uncomplicatedly delicious that I don’t even care. Will it become the pesto of the 2010s? I hope so, because that means it’ll be on everything, everywhere. Gently melt the butter and sugar together till it forms a cohesive and alluring paste. Raise the heat a little and allow it to bubble up and boil. Remove from the heat and stir in 1/2 the cream (1 cup). It will likely bubble enthusiastically at this point. Stir till smooth, then stir in the second 1/2 of the cream. Once it’s cool enough to taste, try adding 1/2 a teaspoon of salt and then move up from there. It will thicken as it cools. In a large pan, whisk together the sugar and cornflour so that any large lumps in the cornflour are dispersed. 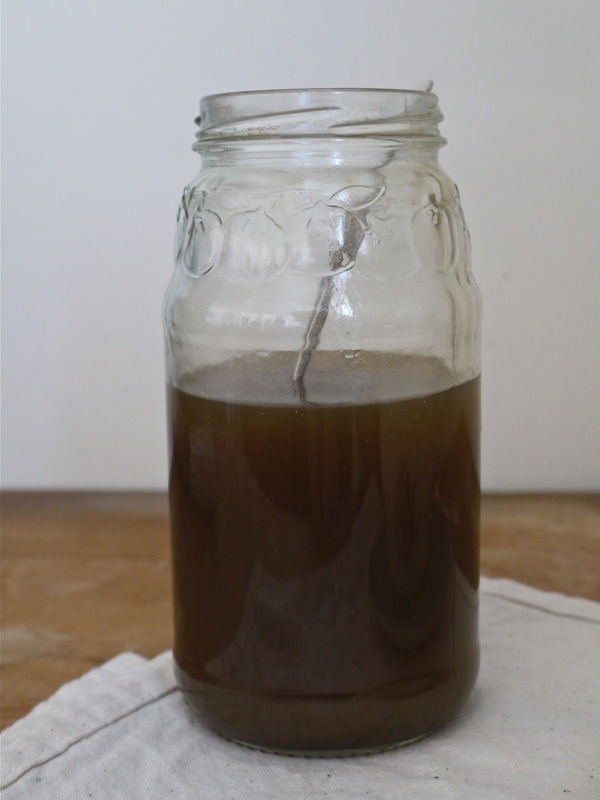 Then whisk in the coconut oil – just to mix it in roughly, be aware this is going to look a bit weird for a while. Set the pan over a low heat so that the sugar starts to soften and caramelise a little and the coconut oil melts into everything. It doesn’t need to be anywhere near liquid, just good and hot, when you add the first 250ml (1 cup) of water and the golden syrup. It will hiss and bubble, so stir it well till it’s smooth. Don’t worry about any cornflour lumps, they should disperse eventually. Add the second 250mls water, bring it to the boil, and then let it bubble away until syrupy and somewhat reduced in volume. Remove from heat, and once it’s cool enough to taste, add salt till you’re happy. Sauce one: Look, butter is just the best thing in the world, okay? It’s not a competition between the two, but while I’d happily pour the vegan one on my ice cream or other suitable catching nets, I could even more happily drink a pint of the other one. From a pint glass. Every day for a year. 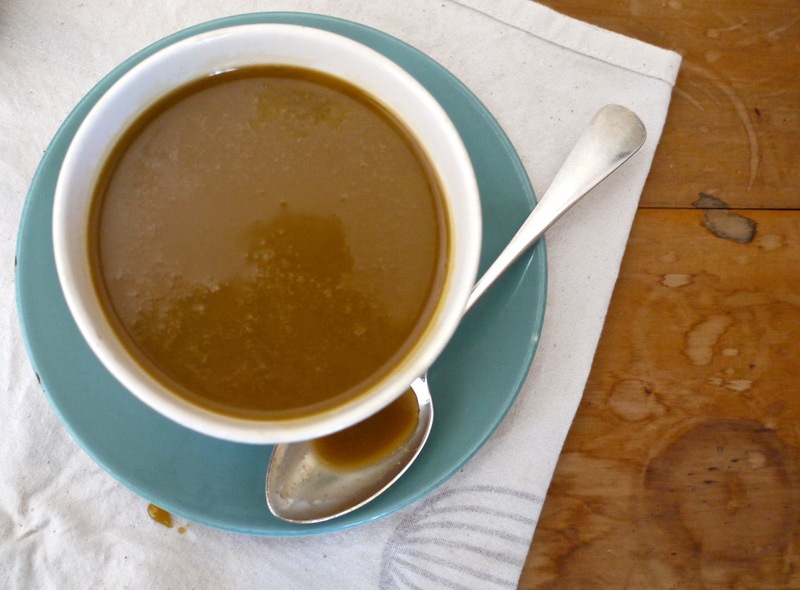 For all its simplicity, this sauce bears a deep, aggressive caramel flavour and luscious thickness, with hints of butter’s nuttiness and the brown sugar’s fudginess roughing up the cream’s own clean richness. I didn’t hold back on the salt – any more and it might be a little bit too soy-sauce marinade – but it’s perfect, a slight shock to the tastebuds, stopping it from being too straight-up sweet but delivering the dizzying flavours to you even faster. Sauce Two: Oh no, I’ve used up all my adjectives for the word caramel describing the last one! This clever sauce has a double life – if you use it hot, straight from the pan, it’s a rich clear syrupy sauce, the kind that soaks well into spongy puddings. Once cooled it’s opaque with more body and a slow-moving texture thanks to the custard-thickening effect of the cornflour. Without the dairy to dilute and enrich it, the sweetness is a little more upfront – but when you’ve got the sticky toffee flavours of brown sugar and golden syrup providing the sweetness, this is no bad thing. Despite the random acts of uselessness, my weekend was fantastic, and a bit of a reunion with everyone we went on holiday with over summer. The high point was Saturday night, which saw a group of us going to see Beirut, the band that sounds like a place, at the Opera House. They were just wonderful. The show was made even better by having said friends at our house both before and after for snacks and drinks. I had planned on feeding them all this caramel sauce but the chocolate sorbet I made for it to be poured over didn’t turn out as planned…but it’s a decent excuse to orchestrate other fun times. Or to drink the sauce by the pint! Title via: Oh Blur, with your handsome handsome frontman and your song Caramel, so perfectly suited to my blog post. Laurie Beechman. She died in 1998 so there’ll never be anything new from her, but luckily her incredibly powerful voice was commited to some albums and cast recordings. There’s precious little of her work on youtube but watch her sing On A Clear Day – I cried. If you don’t think you can sit through a Streisand cover, try Seth Rudetsky’s loving deconstruction of why her voice is amazing. Lovely to see the so-old-it-predates-Retro Crown Lynn bowl being so useful. (I don't think it was designed to take hot-hot contents; time will tell. )Salted caramel ice-cream sounds wonderful. Up there with Whittaker's peanut slab ice-cream. Considering me no likely pesto and me loveylovey salted caramel, I vote yes to your suggestion for the future. Also, from my language just there, I'm joining you in not-grown-up world. And you're totally beating me on that front with the whole long-term-relationship thing, too. This is all making no sense. I'm sorry. I've just eaten rather a lot of vegan chocolate spread, you see. Salted caramel – nom nom. Great minds think, you know, alike. This is blimmin' good on everything. Everything. LOL I like the note to the self portrait! Good job it was in silhouette! Sauce sounds decadent and addictive!!! I used to be a bit obsessed with pesto in the early 2000s, but it *was* the early 2000s and I was from a very small rural village, so. Uh oh, I love pesto. A LOT! And I like to talk about it, too. Does that make me lame and out of date? Does it have anything to do with me still wearing an N*Sync shirt? I'm not from a small rural village. Eerrrrrp! Talk about collective shakiness – mine mental, yours legit physical. 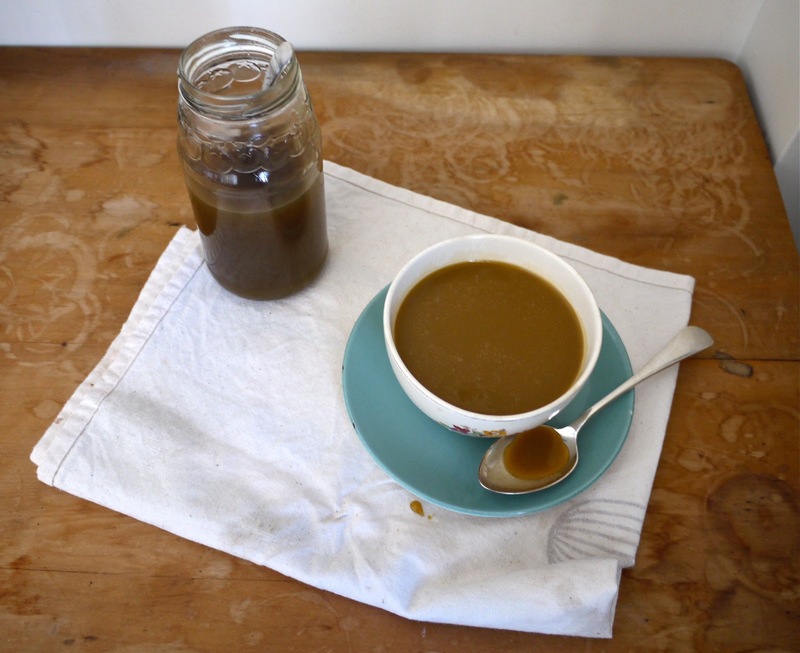 I made a nicely sized batch of salted caramel sauce last fall, but it is of course long gone. I know what you mean about wanting to slurp it down. There's something serious between me and sauces. Caramel sauce, Alfredo sauce, leftover sauces at Asian restaurants…. I drink them all. I've never made caramel before but you make it sounds so delicious and adventurous I might throw caution to the wind and give it a go! this seems sooo indulgent! I really envy people who have the ability (and time) to make this sort of stuff. When I go on my post-book-submission-detox, I should do some cooking therapy. 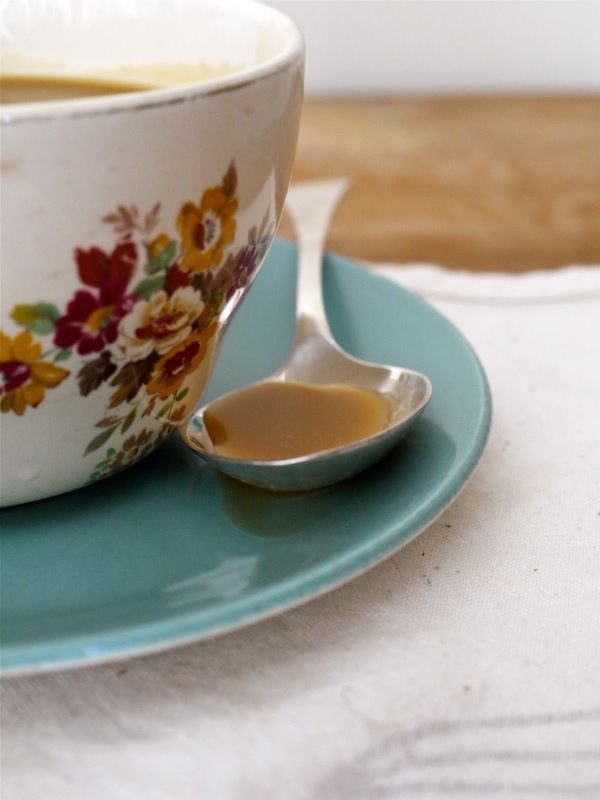 Salted caramel just so good & a band wagon I am more than happy to jump on to! Salted caramel is seriously one of the most wonderful creations in the known universe. I tried some on top of cupcakes last week and it tied everything together in such a deliciously savory-sweet way. Salted caramel is one bandwagon I will happily jump on. I might even ringlead it. I'm so intrigued by this vegan version…not that I am vegan at all by any means, but the more caramel in my fridge, the better, right? If my life's anything to go by, getting older doesn't make you more grown up. You just get to the point where you accept who you are. And then I think the next bit is to enjoy who you are. Probably when you reach complete nanahood, you kick up your heels and don't give a damn about who you are — or aren't. 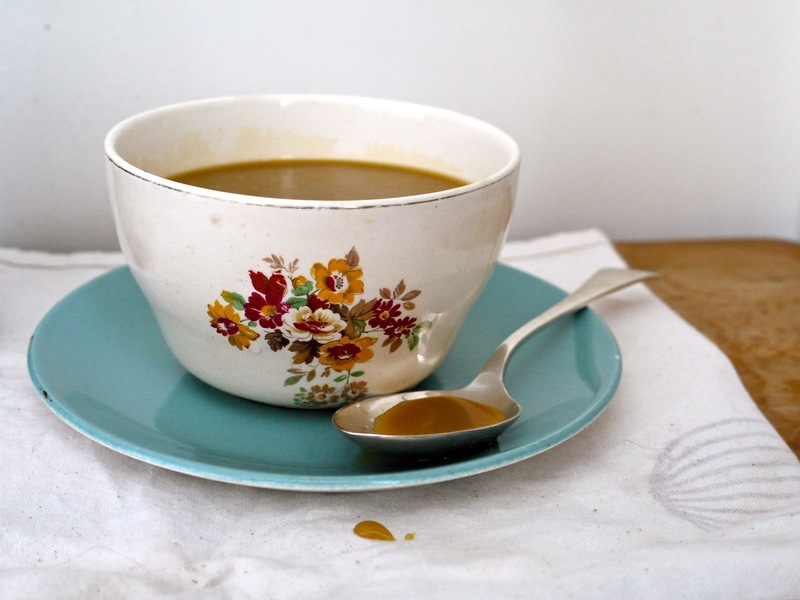 And anyway, with caramel sauce like that up your sleeve, you can be as late or clumsy as you like! 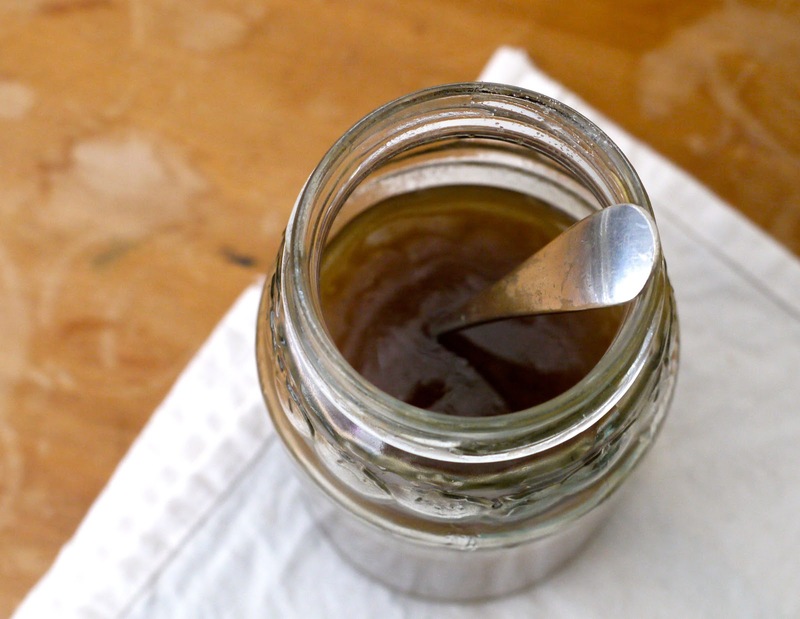 looks delicious, i just remembered I had a batch of toffee sauce in my fridge…must eat that!